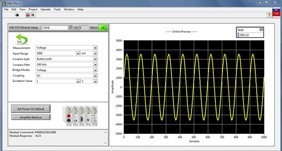 LabVIEW is a graphical programming platform that helps engineers scale from design to test and from small to large systems. It offers unprecedented integration with existing legacy software, IP, and hardware while capitalizing on the latest computing technologies. LabVIEW provides tools to solve today’s problems – and the capacity for future innovation – faster and more effectively. 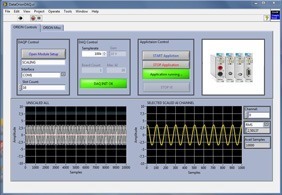 The software is ideal for any measurement or control system. Integrating all the tools that engineers and scientists need to build a wide range of applications in dramatically less time, LabVIEW is a development environment for problem solving, accelerated productivity, and continual innovation. LabVIEW can run under Windows and Linux environment. 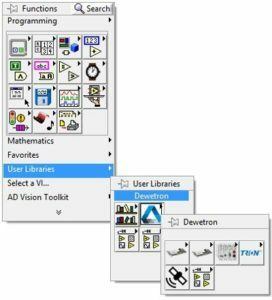 We offer a comprehensive driver library for all DEWETRON systems and components, accessible as “palette” in the user library, as it is common in LabVIEW. Using low level virtual instruments (VIs) you can create your own project from scratch. Use them to access every single setting of the entire data acquisition hardware chain, incl. but not limited to sample rate, input ranges, sensor excitation, anti-aliasing filters, input coupling, digital I/O and counter channels, on-board RS485 interface, CAN bus interface etc. DEWETRON does not offer the development environment of LabVIEW itself – please consult your nearest National Instruments office.